Is The Andersons, Inc. Destined for Greatness? Let's see what the numbers say about Andersons (ANDE). Investors love stocks that consistently beat the Street without getting ahead of their fundamentals and risking a meltdown. The best stocks offer sustainable market-beating gains, with robust and improving financial metrics that support strong price growth. 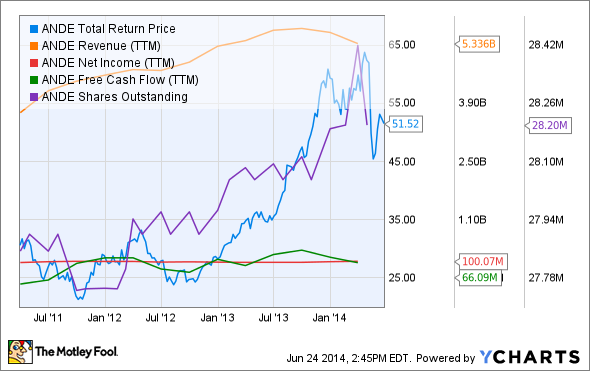 Does The Andersons (NASDAQ:ANDE) fit the bill? Let's take a look at what its recent results tell us about its potential for future gains. ANDE Total Return Price data by YCharts. 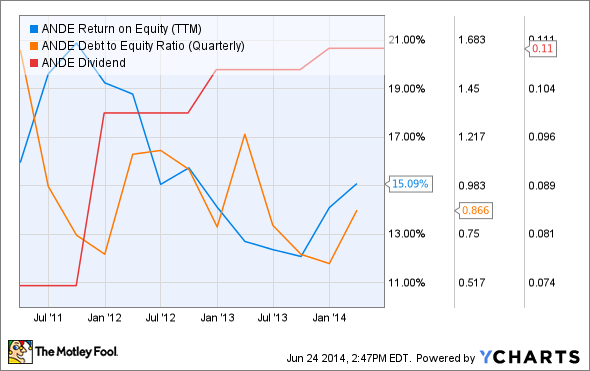 ANDE Return on Equity (TTM) data by YCharts. The Andersons puts together a strong performance by achieving six out of nine possible passing grades, and it could quite easily claim a rare perfect score next year by simply improving its bottom line at a slightly faster pace. While Andersons' free cash flow has surged from negative territory, it has been quite erratic during our tracking period when compared to the far-more stable net-income metric, which can be easily explained by the seasonality of Andersons' farm-focused business. Can Andersons put together the right growth that will propel it to perfection in 2013? Let's find out. The past two months have been choppy for Andersons, which took a dive in May on weak earnings, only to recover by early June thanks to an analyst upgrade from BMO Capital. The upgrade pegs a $56 price target -- that's a meager 9% gain from today's prices -- to Andersons stock, but most analysts are less optimistic, as there are five hold ratings on record as compared to three buy recommendations. Part of this caution may stem from a push from Warren Buffett's Berkshire Hathaway railroad subsidiary BNSF to offload safety compliance costs to railcar operators following a string of devastating accidents during the past year. With more than 22,000 railcars and locomotives under management, Andersons might seem to be at risk from such a pushback; but it's worth remembering that its rail segment accounted for only 5% of Andersons' total revenue in the first quarter. Andersons not only serves as a major corn distributor, it also processes corn into ethanol, to the tune of more than $800 million in segment revenue last year. Its front-and-back reliance on corn makes it essential that prices hold the line at the very least, and another uptick would certainly help Andersons boost its margins again to levels worthy of a perfect score. 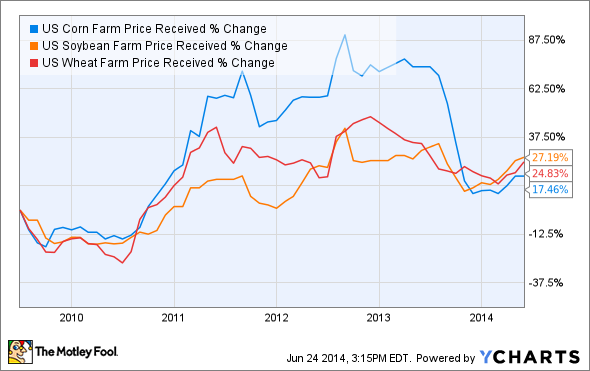 This uptick is already in motion, as all three grains have recorded price growth of at least 6% -- soybeans are the outperformer with a 12% year-to-date gain in price per bushel. Investors should also cheer Andersons' commitment to its dividend, which has been paid out without fail or reduction 71 times since the company went public in 1996. In that time, payouts have grown by 1,000%, more than justifying the patience of investors who dove in nearly two decades ago. Investors should also appreciate a modest 14.5 P/E ratio. While that's hardly the cheapest Andersons' shares have ever been, it's quite affordable considering the fact that the company's EPS has grown 300% in the past decade. Today, Andersons has many of the qualities that make up a great stock; but no stock is truly perfect. Digging deeper can help you uncover the answers you need to make a great buy -- or to stay away from a stock that's going nowhere. Can Andersons Meet These Numbers?